A deck in your back yard will not just be a meeting place for your family and friends in the warm spring, summer, and fall months in our region. It will be a beautiful statement piece, and a classicly rustic addition that fits true in the style of Northeast, and more specifically, upstate New York architecture and design. The use of wood over stone or concrete will lend a cohesive theme to your yard, and tie together the prominent wooded areas this region is known for. Decks are unbelievably versatile, and can be as simple as a land-level square big enough for a table and chairs, to a multi-level architectural masterpiece with character, functionality, and appeal. We'll take care of all the work, from any necessary leveling or filling, creating a solid foundation, and the meticulous construction of the deck you've been wanting for years. You can trust our track record of expertise and experience to create a safe, warm, and welcoming place for your brood to gather. At the end of the experience, you'll undoubtedly have the deck you've been dreaming of, and becoming the envy of the neighborhood. 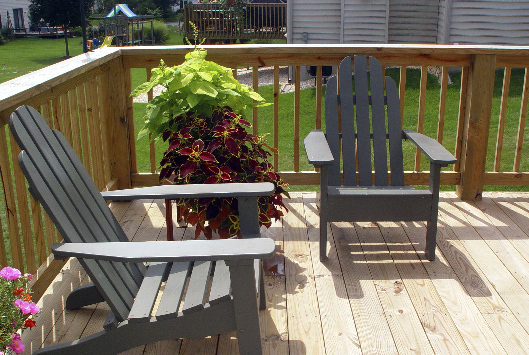 Contact us today to get started on creating the deck of your dreams!